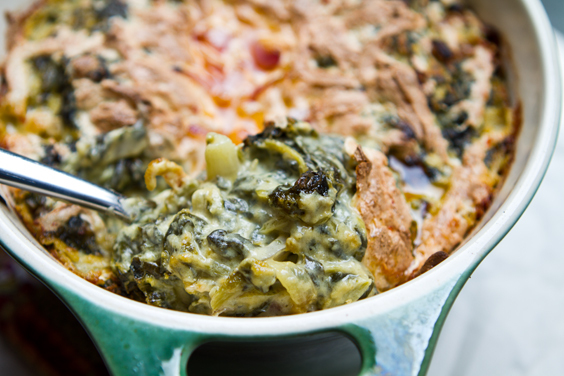 Baked Vegan Spinach Dip. Kraut, Onion, Truffle. 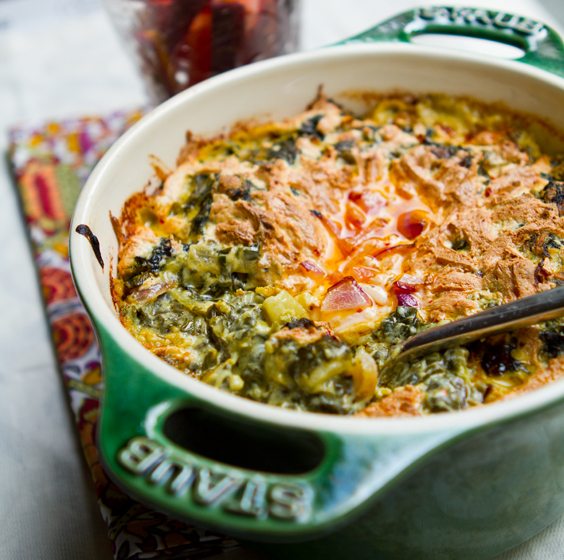 Make my spinach dip today - it is easy! - from start to finish you will be snacking in about 30 minutes!.. Spinach. Dip. 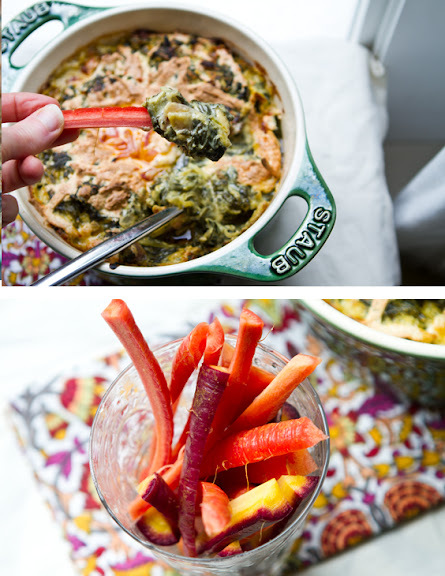 A few years ago I posted a yummy recipe for vegan spinach dip. This time I'm adding a new twist and simplifying the ingredients. 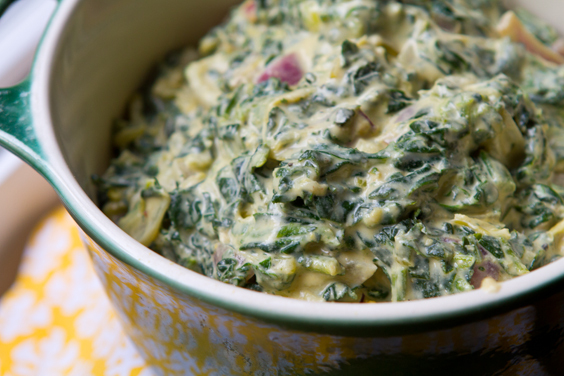 Tangy sauerkraut and chopped red onions are stirred into this creamy green mixture. Then I pile my dip into an oven-safe dish, top with heaping handfuls of vegan Daiya cheese and bake until bubbly. The vegan cheese becomes crispy and browned on top while the creamy green insides are fluffy and moist. 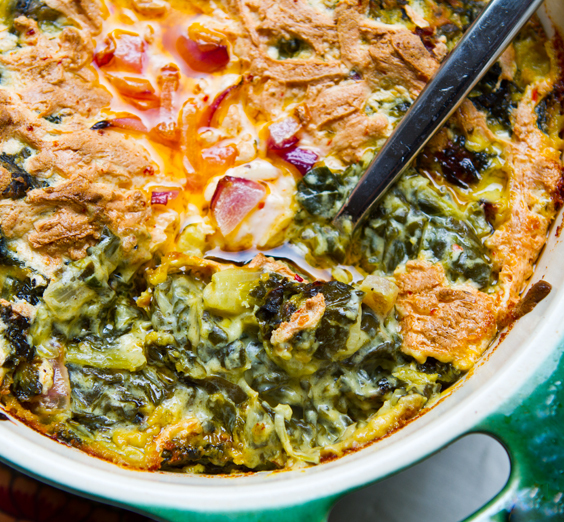 You crack open the crisped cheesy crust and dive into spinach dip bliss. Serve with a few freshly chopped carrots or crusty bread slices for a snack platter to impress. 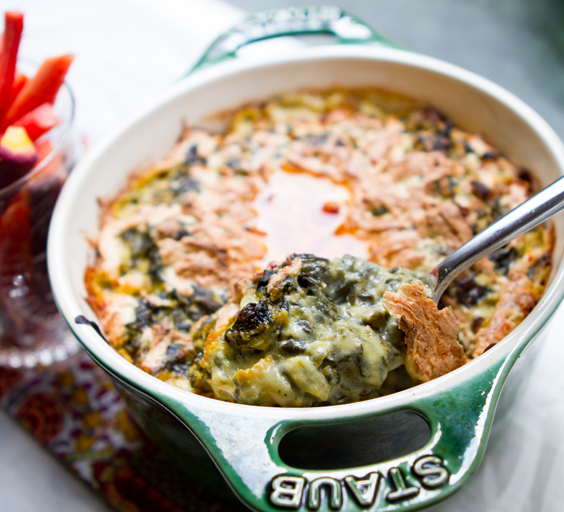 Straight from the oven this spinach dip bubbles and steams for a few minutes. 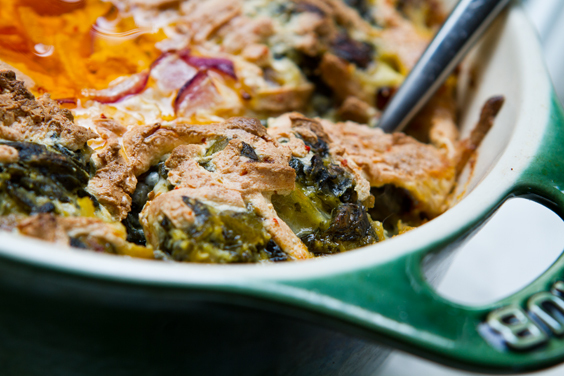 There is no better way to serve spinach dip than bubbly hot, right out of the oven. But yes, this stuff tastes amazing chilled too. Heated dip before baking and adding cheese..
Artichokes, sub Sauerkraut. Usually you find spinach dip infused with artichoke. Artichoke hearts are lovely because they have a slightly tangy, hearty, tender texture that holds up well in dip and compliments he sweet, silky, wilted spinach. Artichokes add flavor and texture. Well I decided to use sauerkraut in this dip since it is also nice and tangy with a rustic full texture that enhances the body of the dip. Creamy, hearty, bold and decadent. 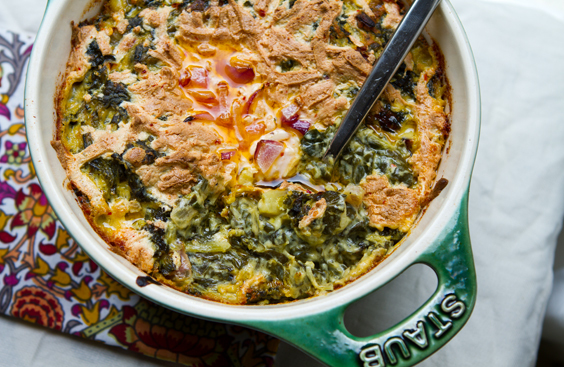 This dip is for spinach dip lovers. Lighten it up! 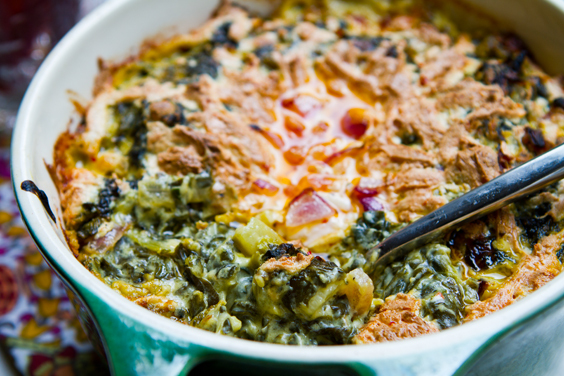 If you want lighten up your spinach dip, you can remove most of the added oil and simply sauté the onions and kraut in a splash of water. You can also greatly reduce or remove the Daiya cheese. And for the sour cream, you can also reduce that. You will have a less creamy dip - with more spinach in each bite. But still super yummy. 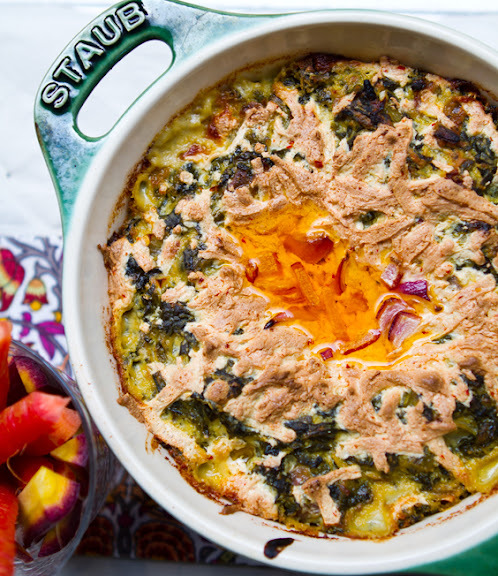 Lets face it, you could craft a dip using a base of chopped spinach and nutritional yeast and it would be delicious! The sour cream, cheese and oils are really to give it that decadent edge. So these ingredients are easy to reduce. You could also sub plain soy yogurt for the sour cream if need be. Another way to get creamy dip is by adding pureed white beans. 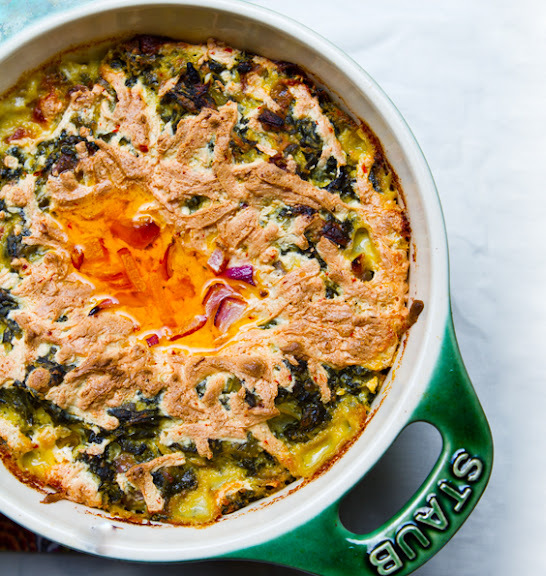 This also adds a nice spinach/bean dip texture and loads of healthy fiber and protein. I added beans to the last spinach dip I posted. Truffle. The truffle oil is optional. But it really does add a hunger-inducing aroma to the dip. And when you bake it the house fills with a spinach, cheesy truffle flavor. But if you want to indulge, make this bowl as is and enjoy!.. 1. (preheat oven to 400 degrees) Add the truffle and safflower oil (or any vegetable oil) to a medium soup pot. Over high heat. Add in the diced red onion. Saute until they begin to caramelize. 2. Add in the lemon pepper salt and a spoonful of the nutritional yeast. 3. Add in the sauerkraut and sauté for another minute. 4. Add in all the remaining ingredients. Fold in the sour cream, spinach, nutritional yeast, cider vinegar. Heat and stir until all the spinach has warmed and the mixture if fluffy and creamy. About 5 minutes over medium-high heat. Do a taste test and add more salt/pepper/nutritional yeast as desired. If your mixture is a bit too thick (compare to my photo above), add in a splash of plain soy milk. 5. Remove pot from heat and fold in the flour and 1/4 cup chopped raw onion. 6. Transfer to an oven-safe dish and top with the shredded vegan cheese and a pinch more of raw red onion. Lastly, add a final drizzle of olive oil or truffle oil if desired. 7. Bake at 400 for 16-20 minutes. Then broil on high for another 1-2 minutes or until the cheese browns and bubbles. Serve warm or chill in fridge to serve cold. StumbleUpon it! If you like this post - please show your love by StumblingUpon it! Button at top.